On Wednesday, November 8th, the Smithfield Police Department unveiled a memorial for Sgt. Steven M. Shaw (Providence Police Department) in a ceremony at the police station. On February 3rd, 1994, Sgt. 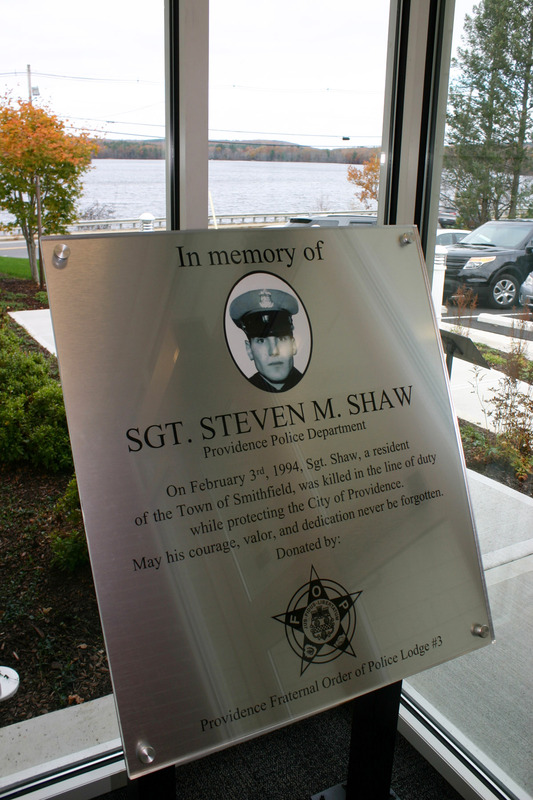 Shaw was killed in the line of duty while serving the City of Providence. At the time of his death, he and his wife, Maria, had been residing in Smithfield for approximately 1 1/2 years. Sgt. Shaw will forever be remembered as a resident hero. A special thank you to Maria Shaw and Robert “Bobby Shaw” (Steven’s father) for giving us your blessings to move forward with this memorial of your beloved Steven. Thank you, as well, to Colonel Hugh Clements and members of the Providence Police Department and Providence Fraternal Order of Police for participating in today’s ceremony. YOU ARE A CLASS ACT!